Tactics: Most Viral T-shirts ever series of blog posts, Hot new Tees weekly newsletter, Create your own Viral T-Shirt Award (with prize), T-shirt customization mobile app. Tactics are actions you take to execute a strategy. But what are some common tactics you can use as part of a “big picture” strategy? Here’s 8 tactics for getting more customers for your Miva Merchant store. Discounting is not a long-term strategy but it can be highly effective in driving new customers to your store. Figure out your customer acquisition cost and from that, how much of a discount (on a limited amount of quantity / product) you can afford to offer in order to acquire new customers – then announce to the world via Twitter and your blog! Just be careful of attracting deal-hunters, since these customers may not be of long-term value to your business. Competitions can be a fun way to spread the word about your store but remember to keep the competition purposeful to your brand. Don’t run a viral T-Shirt competition if you’re selling pet food! You can extract maximum exposure from competitions by building in a voting mechanism – in order to win or be shortlisted, participants have to get their friends to vote. Take for example Scottevest.com, a Miva Merchant store selling vests with plenty of hidden pockets, perfect for travelling. 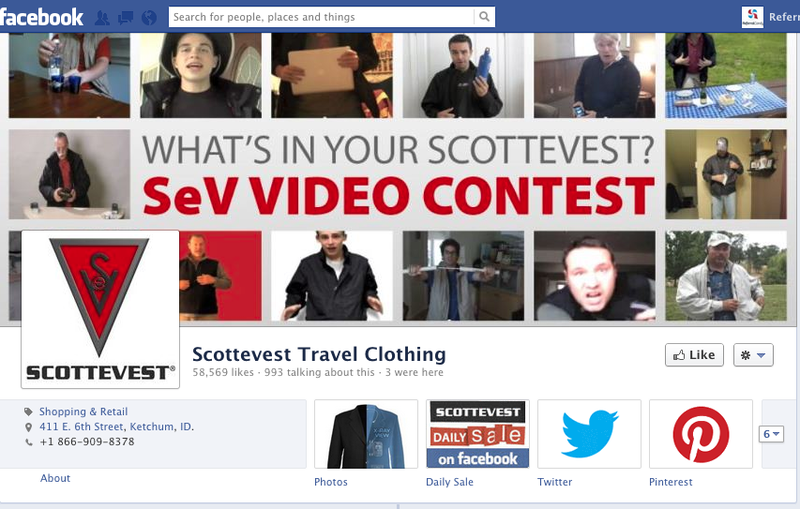 Scottevest ran a contest on Facebook (below) asking their customers to send in hilarious videos of what they used their hidden pockets for, a really fun way to spread the word about the unique selling point of their vests! Running a Facebook contest is a great way to drum up publicity for your store. Partnering with a non-competitive but audience-complementary partner can be a highly effective way of acquiring new customers. This can be something as simple as a traffic exchange – partnering with a highly-trafficked site in your customer’s domain, putting up a banner to drive traffic to your shop, and paying the partner either a cut of the cart revenue or a flat fee for every customer acquired via the partner banner. It’s no quick-fix, but writing authoritative, interesting content in your online shop’s contextual domain will pay huge dividends over the long term. Targeted content will help boost your site’s SEO bringing in new customers organically, and will also encourage your existing visitors to share your content more. Every online shop should have blog content as part of its marketing strategy! Take for instance another Miva Merchant store, Plasticland.com, “purveyors of kitsch curiosities and retro clothing”. 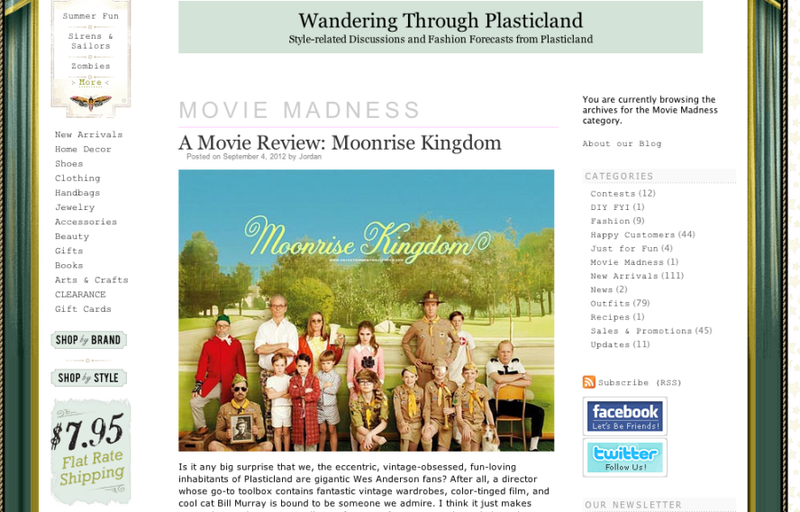 In line with their alternative fashion boutique image, their blog features fun and kooky products, books and movie reviews, such as this one below of the Wes Anderson movie Moonrise Kingdom. It’s a great way to bring in SEO, as well as build an identity for themselves! Targeted blog content can drive the right kind of search traffic to your store. It’s one of the most basic forms of driving people to a product or service, but don’t forget about it! Experiment with Google Ads since you can fine-tune your targeting and choose how much you want to spend. In the age of social media, effective marketing is not just about getting people to come to you – it’s about participating in the channels that your customers are participating in whether that’s Facebook, Twitter, Instagram or any of the other dozens of popular services. Pick the channels that are right for your business and participate authentically – remember that social media is not there to simply drive people to your store, it’s also there to help you create stories about your business that people can share with others. To get some inspiration, check out the Top 10 Most Popular Online Retailers on Facebook. A valuable method of customer acquisition is when existing customers refer a friend. When this method works really well, all the marketing is done by your existing customers, meaning you can focus on running your online store instead of spending time bringing people to it. Referrals can happen organically via word of mouth marketing (focus on great products, great prices and excellent customer service – these alone will get you very far) but you can also implement a refer a friend app such as ReferralCandy to automate the process. Remember that no one strategy and one set of tactics works for everyone. Define your strategy and figure out what works for you and your store, always testing and refining your plan along the process. Good luck! Alvin Lee is the marketing manager at ReferralCandy, the refer-a-friend app that helps online stores get more sales through word of mouth. You can reach out to us through Twitter and Facebook.